December 8, 2009 May 31, 2012 Nefer Khepri, Ph. D.
Whew! My Blog is Up! Well, they said Blogger would be easy, but then again I was told giving birth to a child would be easy, too. I need to be more discerning about who I listen to! LOL Anyway, it’s up, here it is, take a gander and let me know what you would like to see posted here. A word about my name ~ I am a spiritual practitioner (candle work, reiki, tarot, channeling, and soul portraits) and I call upon Egyptian deities when I perform candle work. I must admit right up front that my name is a professional psuedonym I was forced to choose due to my husband moving up in the banking world. His bank is owned by born again Southern Baptists and if they found out about my business my husband would surely lose his job. Egyptians add titles at the end of names. “Hemet” is a title and it translates as “Priestess.” I have been a practitioner of Wicca since 1981 and a priestess since 1994. The reason is simple: I took this picture on November 21, 2009 in Lafayette Cemetary, No. 1 in New Orleans, Louisana. My husband took me there on a surprise vacation. I went to the cemetary with the hope of catching something paranormal in a photo. I took several pictures of this statue of the angel, which is on top of a mausoleum, or ground-surface tomb. I took two shots of him with the tree in the background. I didn’t move and the atmosphere never changed. This is the first shot. The second shot is the same except that this large cloudy mass is missing from the second shot. You can see it extending all the way from the middle of the left-hand side of the picture and completely across the angel and slightly beyond him to the right. Needless to say, when I arrived home and uploaded my pictures I was thrilled to pieces with this photo! My first thought was, “this will be the picture I upload to my new blog!” So, here it is. I’d appreciate hearing what you think about it. The next day while on a ghost tour I caught some orbs in pictures and will be posting those soon. Since they’re small orbs I’m not sure they will translate well to the internet, but we’ll see. 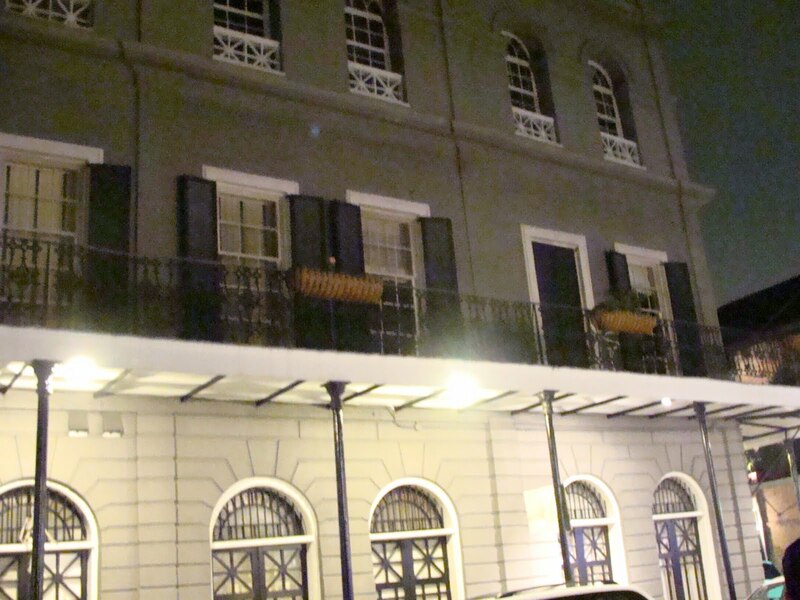 This is the infamous LaLaurie Mansion in New Orleans. Google it and read all about Dauphine LaLaurie and I can about guarantee you’ll have nightmares. This was one evil woman! Anyway, if you look closely at the second floor just below the 2 center windows of the third floor you’ll see a bluish sphere. That, my friends, is an orb. I caught it myself and no, it was not visible with the naked eye. If you look for light sources you’ll see that obviously the exterior is lit along the overhang from the second story balcony. However, the light travels only downward, not up. The entire mansion (currently owned by actor Nicholas Cage, but he’s looking to sell due to all the bad spirits there – he says he’ll eat there, but he won’t sleep there!) on the interior was dark. The only other source of nearby light was a mock gas lamp on the corner. It was nowhere near as bright as to be able to cast a reflection up to the second floor of this building. Also, the exterior is gray unpolished stone. This is not a reflective surface. If you will look at the balcony and the light between the two second floor windows on the right and the two windows in the center you’ll see what appears to be a white cloud. That’s not a cloud. It’s a reflection from the light shining from the ceiling of the second story balcony overhang. So you can see the difference in a single shot between a reflection of light and then whatever it is I caught. Note that it’s blue. Watching paranormal television as much as I do I’ve seen tons of “orbs” on TV, however, they always appear to be white or grayish and these can easily be discounted as dust particles, bugs, or reflections. The orb that I caught was blue and it also moved from the far left-hand side of the building almost all the way to the right side. Reflections don’t move. This is what I told my husband who is convinced it’s a reflection, but then he thought it was kind of weird how it kept showing up and seemed to be moving. I wasn’t moving. I took all my shots from the same stance. Let me know what you think! I’m dying to know. My digital camera will give you a 1-second freeze frame of every photo I take so I can have a quick look. When I saw that I had caught an orb (a smaller one in an earlier picture) I began snapping like a mad woman! I caught several orbs along the exterior of this building. This is just one of the better shots that I think would show up best here. New Orleans is an awesome city and I highly recommend it if you ever get the chance to go, please do! For those of you interested in the paranormal, there’s a lot to see and do there. I’ll be writing more about the great time I had in upcoming posts. I look forward to hearing from each of you and I hope that you enjoy my blog. Nefer Khepri Hemet, Ph. D.
Welcome to blog land! I love the photos of New Orleans–it brought back poignant memories, as I used to live there before Katrina! You're right, it is a fascinating, mystical place and lots of paranormal there. Thanks so much for posting what you found there, I love catching orbs too! I am very happy that you have a blog up!! It's a nice way to keep in touch you and be inspired too. I will def check it often. Thank you!